Radius Wellcare is a mult-disciplinary alternative medicine parctice in Florida with 15 practitioners. 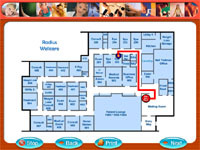 Radius uses TouchTrak for patient scheduling, self-service check-in, and the TouchTrak practice managment features. TouchTrak will easily integrate with your existing core back-end application using XML, HL7, web service and other standard data exchange protocols using the ClearSpan interface engine. 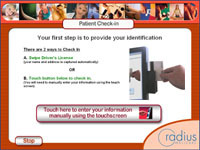 This interface engine is currently being used in over 2000 hospital and general practice facilities in the US and UK. Schedule resources such as X-ray, lab, medical equipment, conference rooms, etc. Integrated with document scanners for rapid capturing of scanned documents such as insurance card, driver’s license, etc.